For those who have followed along on the blog, you may recall that this blog started with some arguments I had with folks on an audiophile forum around the audibility of high bitrate MP3. Back in those days (err... late 2012), there were all kinds of claims made by quite a few hobbyists that they could "easily" differentiate lossless FLAC from 320kbps MP3. I'm sure there are still many in the audiophile forums who hold this view although I think things have softened about the magnitude of differentiability (I think this shift has changed with high-res audio as well). That disagreement was enough to push me to put out a blind test, to start looking into what I could do to help further my own understanding and awareness around audio hardware. The articles on this blog basically have been the culmination of that pursuit in hopes that the ideas and tests have been useful for others also on this journey looking for some clarity, typically found with more objective analysis. Objective testing requires disciplined procedures and tools. Methods to reduce variables so that we can have reasonable "apples-to-apples" comparisons and reduce or eliminate psychological biases when we make decisions and search out facts beyond opinions colored by idiosyncratic preferences. Whether it's using an ABX tool, asking a partner/spouse/family/friend/neighbor to change something without our knowledge when listening, or measurement devices - letting the tool demonstrate changes - I believe we can find answers to uncertainties or prove claims. I personally believe objective testing is not only something "nice to have" with reviews, but an essential part of developing insight into the devices being tested and our own perceptual and cognitive limitations. The German company RME has been mentioned a few times over the years on my blog pages. My friend who does studio productions uses this company's professional ADC/DAC devices and provided me with recordings when I was evaluating MQA over the last few years (eg. here, here) done with RME gear. I was impressed with the quality of the recordings he was able to produce. 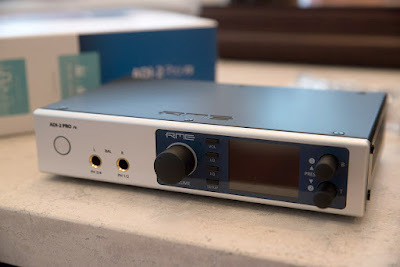 Furthermore, as I discussed with others the idea of upgrading my measurement set-up, the RME name came up a number of times, especially the ADI-2 Pro devices. This is particularly relevant for my situation because one of the identified uses for the ADI-2 Pro is that of audio measurements (it's discussed in the manual) given the "instrumentation-grade" accuracy of the device. 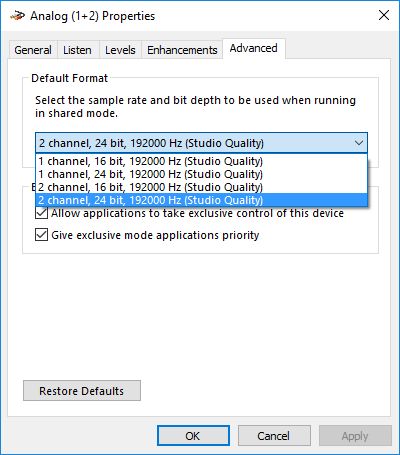 Of interest, ongoing optimizations to the firmware have improved performance in this regard and I see they recently in June added a compensation filter to smooth frequency response measurements. With these developments, it was simply a "no brainer" to get one of these to use for what I do here! 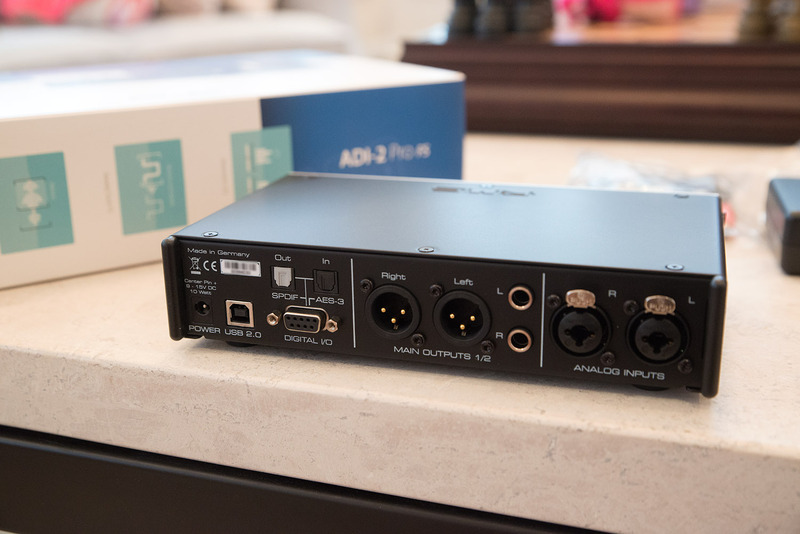 The ADI-2 Pro was first released in April 2016 as a 2 analogue channel in/4 out device with "reference" quality high resolution ADC and DAC while maintaining a reasonable price point (~US$2000 - as usual, shop around for the best price). Check out the detailed review on Sound-on-Sound from 2017. The release of the ADI-2 Pro correlated with the company's 20th anniversary that year. Earlier this year (April 2018), the "FS" version was released with upgraded clock resolution into the "femtosecond" range for even lower jitter (they call the system "SteadyClock FS") at around the same price point. Remember from a couple weeks ago my thoughts on jitter - practically, I don't believe it's audible but for a professional and measurement device, clock precision is important. Depending on where you are in the world, it should not be difficult to locate a dealer for RME. With the arrival of the FS model, I've noticed a price drop in some places for the "non-FS" model (I've seen ~$1300-1600 on Amazon). There's the device itself. Given the capabilities, it was smaller than I had initially expected. Handsome metal construction with silver front and black steel elsewhere. I see they had an all-black Anniversary Edition in the past - that one looked amazing (here's a Russian page with some great internal pictures)! Inside the plastic bag in the picture are break-out cables for electrical S/PDIF digital input/output (2 coaxial and 2 AES/EBU). There's a small low-ripple external switching power supply and power cable. And finally the manual printed in English and German. I guess I'm old-fashioned. Even though the manual is online (I see it's a "live" document regularly updated), there's something about a nice manual to thumb through while trying to get things running. It has been awhile since I've seen such a detailed document in hard copy with my purchases. If the above summary paragraph sounds overwhelming, I'm sure you're not alone in feeling this way :-). While getting the machine running can be done quickly and far from rocket science, there is a huge amount that this thing can do. Going through the manual, I get a distinct impression that the folks at RME are tech geeks looking to wrestle every bit of capacity from the professional-grade hardware. As a professional device, the documentation holds nothing back in attention to detail with specifications, an array of measurements, latency discussions, consideration of CPU utilization and jitter. Recently, they have put work into intersample overload awareness with the metering and providing overhead when performing sample rate conversion. You'll see this level of technical engagement on their User Forum as well. Here it is sitting on top of my TEAC UD-501 DAC. A few things to notice. As I mentioned above, it's relatively small compared to the TEAC DAC. Esthetically, there is nice ring lighting around the left power button and large volume knob. I'm not doing justice to the color IPS LCD screen in this image - the resolution is great for the size and that realtime 30-band graphic equalizer updates very smoothly. To the right (a little dark in the image) are two push-button control knobs and just left of the screen are square physical buttons (VOL, I/O, EQ, SETUP) referring to the various classes of operations to access an intricate menu structure (thankfully summarized in the manual!). We see clean and logically laid out rear ports. To the right are the analogue inputs - combination balanced XLR/TRS sockets (I know it's geeky to say this, but I really like the quality of these connectors and sense of security when plugging things in!). Then there are the analogue outputs - L/R TS unbalanced and balanced XLR in the middle section. The left side is populated by the digital I/O section with USB2.0, optical TosLink in/out, and 9-pin connector for the included breakout cables taking care of electrical S/PDIF coaxial and AES/EBU (XLR ends) in/outs. By the way, the power connector (9.5-15V DC acceptable range, 1.5A) to the far left has a locking mechanism that you turn 90-degrees. A great idea. The only potential downside I think is if one is not aware of the locking mechanism. Without proper locking, the connector will feel very loose (I was a little concerned when I plugged it in thinking the connector was defective but quickly realized my mistake). I know that in the audiophile world, certain consumers put a huge amount of emphasis into big beefy linear power supplies. Remember folks that DACs don't need much power and I have seen/heard no indication that a linear supply makes any difference! There is much to be said about having an external power supply that can be placed distal to the device. Makes it easy to replace, plus an external supply will allow a level of portability running off batteries which could be good to experiment with and practical for professionals who might want to use this device in a mobile set-up "in the field". Not much to say about the sides other than the presence of cooling vents. This is important because the device does run relatively warm after an hour or so. Not hot enough to burn of course, but good to make sure there's reasonable airflow over the top and sides especially on a hot summer day. I'll be sure to check whether the noise floor changes as it warms up (remember that issue back in 2015 with the Tascam UH-7000). III. A Time to Listen! The picture above is my current "digital audio stack"... Top to bottom we have piCorePlayer running on the Raspberry Pi 3 "Touch" audio streamer, the RME ADI-2 Pro FS, TEAC UD-501, and Oppo UDP-205. Before we get technical with testing, I find it's always good to just listen and jot down some impressions. Later on, as I have access to the objective results, it's fun to correlate what was heard with the level of technical accuracy measured. 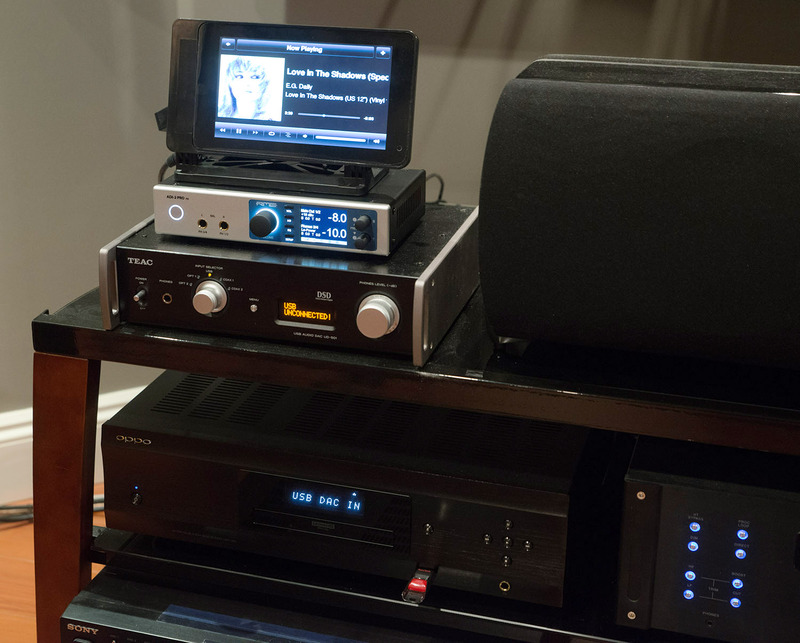 You might notice something interesting about the 3 DAC devices I have there. The internal DAC chipset for each one comes from the "Big 3" companies used in the majority of audiophile gear - dual mono TI/Burr Brown PCM1795 in the TEAC UD-501, ESS Sabre32 ES9038Pro in the Oppo, and now we have the Asahi Kasei Microdevices (AKM) AK4490 "Verita" DAC found inside the ADI-2 Pro FS. Based on the spec sheets, each DAC chip is capable of excellent objective resolution. Each one features XLR outputs for listening through my pre-amp (Emotiva XSP-1) to Emotiva XPA-1L monoblocks to Paradigm Signature S8v3 main speakers with SUB1 subwoofer. 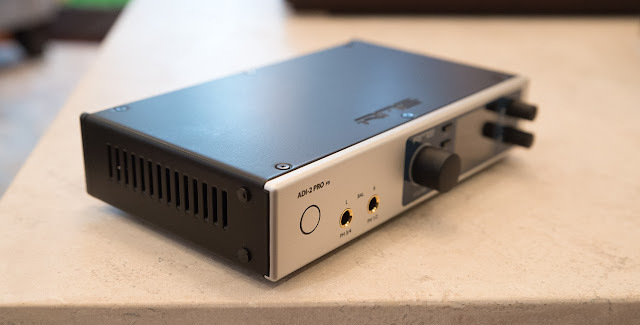 I spent a couple of weeks using the RME ADI-2 Pro FS as my main DAC while listening to music. The device was run with default settings which means digital filter set as "SD Sharp" (Short Delay Sharp rolloff which we'll look at when we runs some testing). While I can change to any of the 5 filters (SD Sharp, SD Slow, Sharp, Slow, and NOS), I figured it's fine to stick with the default for the following observations. Over a few evenings of listening, albums played included Rachel Podger's Biber: Rosary Sonatas (DR13, DSD64 from SACD). A remarkable recording of works incorporating "scordatura" where the string instrument is deliberately "mistuned" to an alternate array of pitches. The music sounded beautiful. Passionate playing, wide soundstage with great placement of the instruments in the virtual space. I loved the joy and majesty of "The Ascension". The only complaint with this album is that I found the recorded noise floor a little high surprisingly. Last week, I mentioned Harold Farberman & The All Star Percussion Ensemble's The All Star Ensemble Plays Bizet, Beethoven, Pachelbel & Berlioz (FIM, DR13). Check out track 5, of Pachelbel's Canon in D. Triangles, castanets, claves, maracas, wood blocks, tambourine... Have a listen to the various instrument sounds spread out between and beyond your speakers. Not just the width, but also notice the apparent depth in this recording. Every once awhile you'll hear foot steps and body movements recorded of the performers. It's not that we necessarily want to hear these peripheral sounds of course, but they will be made audible with high-fidelity, high resolution gear - nicely rendered through the ADI-2 Pro FS. Modern classical recordings are often soundtrack scores and Jerry Junkin & Dallas Winds did a good job on John Williams at the Movies (Reference Recordings, DR15, 2018). Dynamic recording, make sure to turn up the volume on a good system with adequate power! The ADI-2 Pro did a great job on the dynamics on this CD (of course good amps, speakers, decent room are essential!). "Scherzo for X Wings", anyone? When playing DSD, remember that in order to implement volume control, the signal is converted to PCM in the DAC, so turn on the "DSD Direct" option if you want to hear the best quality DSD through the AKM chip. Have a peek at the page 4 block diagram from the AK4490 datasheet. Notice the "volume bypass" mode which sends DSD data directly to "SCF" (Switched Capacitor Filter) blocks. 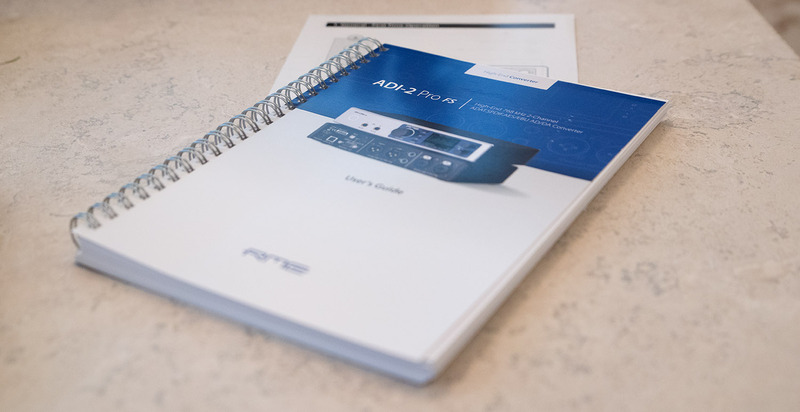 With the ADI-2 Pro, there is actually a very coarse volume control based on the analogue reference levels (+4, +13, +19, +24 dBu - nice mechanism to maintain resolution across signal levels) you can choose when the DSD audio is not playing, but of course lose out on the digital trim control with 0.5dB steps. I played a few WavPack-compressed DSD64 and DSD128 albums including Thriller, The Mission, and Keb' Mo' SACD rips. With amplitude set at the same level, I honestly could not tell the difference between "DSD Direct" mode and letting the DAC convert to PCM for the convenience of volume control. This is good as it's indicative of the fact that the conversion is done in high resolution transparently as far as I can tell. To round off the listening sessions, I had a listen to a couple of recent pop/rock albums - Death Cab for Cutie's Thank You for Today (DR6, "Summer Years" sounds comfortable on a Pet Shop Boys album), and Ariana Grande's Sweetener (DR5, "No Tears Left To Cry" making a run on the Top 40 charts currently I see). Neither albums are examples of model audio engineering and mastering but representative of modern efforts (remarkably, these low-dynamic-range albums are for some reason available on HDtracks in 24-bits!). Both albums sound as expected, good bass in some of the tracks but it's also these pop recordings where one can easily hear the artificial "polish" of the various DSP and digital techniques used in the studio. Remember folks, these kinds of recording are not supposed to sound "natural" and probably are why some people complain of a "digital glare". It's not the fact that it's digital but the way the production is done. IMO, any DAC that tries to make stuff like this sound any different than what they are (a synthetic core with artificial syrupy topping created for ephemeral pleasure) isn't IMO "high fidelity". Having said that, I still enjoy my pop guilty pleasures and make no apologies for it :-). I pulled out both my Sennheiser HD800 and AKG Q701 headphones to have a listen off and on during the evening sessions. The ADI-2 Pro FS headphone outputs are very quiet, clean and provides plenty of power way beyond comfortable listening volume. Easily besting the headphone output on the TEAC UD-501 and Oppo UDP-205 in subjective smoothness of the sound and of course potential volume. No need to engage the "Hi-Power" headphone mode for me (probably wise to watch that potential +22dBu, almost 10Vrms and 30Vp-p level!!!). 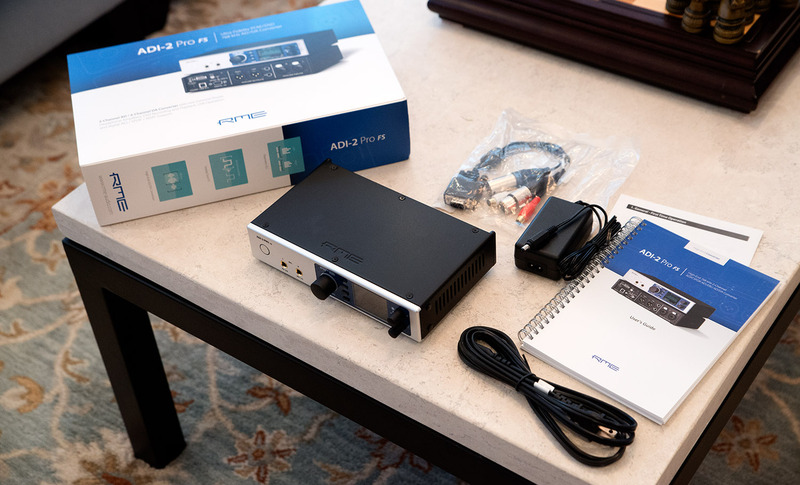 I've seen some very positive comments on the sound quality of the ADI-2 Pro over the last year and so far I'm impressed by what I'm hearing and the overall power of this package. I see that JR_Audio mentioned very stable drivers in a previous comment and I concur! So far, I'm just starting to do some recordings and measurements and have noticed no instability with installation of the drivers on a couple of my Windows computers and one MacBook I've tried this on. Firmware updates were likewise very easy and quick. While I have not done a full set of measurements yet at this point, I suspect we're going to see a very strong performance from the DAC which we'll explore soon. However, as discussed in the Prologue above, what I wanted this device for was as a measurement tool, which means the ADC performance is more important to me than the DAC. As such, with the next installment, let's have a look at what this baby can do! I want to see the noise floor compared to my Focusrite Forte, hook up the same DACs and explore the differences in measurement results... Let's see how much more precise and resolving this tool is. One last thing. I see that RME has released the RME ADI-2 DAC FS a little earlier than the "Pro FS" refresh with many of the capabilities of the ADI-2 Pro but without the ADC input, added a remote controller, one of the headphone outputs has been converted to a 3.5mm low impedance, low noise headphone jack for IEMs, consumer-friendly phono unbalanced outputs, and more typical lower consumer analogue output levels. It's also housed in a nice all-black casing which will fit well on a home hi-fi rack. Priced at ~US$1100, this seems like a smart move for RME into the consumer audiophile space after more than 20 years of experience in the no-nonsense professional world! RME ADI-2 Pro FS: USB Audio Class 2.0 mode under Windows 10 without drivers installed, all sample rates to 32/384kHz available under the Windows Driver Model (WDM) Audio Support. I e-mailed Matthias Carstens (Founder and CEO at RME who is very active moderating and discussing the products on the RME User Forum) about this. Basically this behaviour is by design. 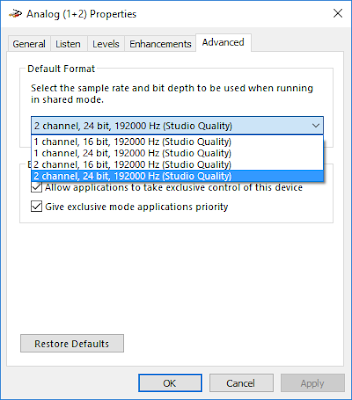 For us at home where we typically just use a basic DAC interface for playback, we might not think twice about changing sample rates in the Widows audio panel or WASAPI since there are really no downstream repercussions. But imagine in a complex professional studio with multiple in/out devices often operating simultaneously, potentially utilizing various drivers (especially ASIO) depending on the device and complex audio flow, it makes sense to keep something as foundational as the sample rate constant. The decision made was to centralize sample rate control. Every time there is a sample rate change in the RME driver settings or ASIO, the WDM device is removed and a new device with only the new sample rate setting is registered. The easiest one to show is what happened above. Changing the sample rate from 384kHz to 768kHz resulted in the disappearance of the "Analog (1+2)" WDM device. This is because 384kHz is the highest that can be registered currently in Windows WDM/WASAPI. Bottom line for folks interested in this device. 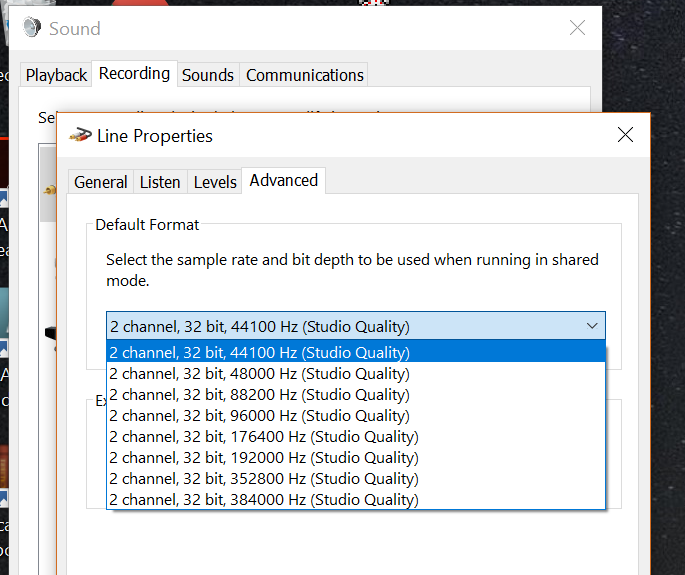 If you're going to use software that works well in WASAPI, want to change sample rates in Windows Sound settings, do not need some of the driver-dependent features like DIGICheck, then don't install the RME drivers and just stick with WASAPI for bit-perfect audio with sample rate control. Just make sure to install the newest firmware first that supports UAC2 of course (NOTE: I believe you'll need to install the RME driver first before firmware updates, you can uninstalled the driver afterwards. By the way, firmware version 180/88 was just released ~August 20th with an important bug fix for using the ADC at 352+kHz). However, if you need/want/prefer ASIO, then by all means install the RME driver package and stick with that. Your software will be able to change sample rates in ASIO. But for software using WDM drivers like WASAPI, control the sample rate through the RME MADIface Settings panel in the taskbar. I think that's enough for this week! Until next time, enjoy the music :-). Thanks for the note Juergen! Hey man, if you experienced brain "overload" 15 years ago, I'm certainly feeling "megaoverload" at this point 15 years later :-). > Also one can playback and record using two ASIO apps. E.g. REW sweeping through an external device and capturing the output in Audacity ASIO version. No need for the ASIO version - you can use WDM and ASIO at the same time. Simultaneously you can always run their Digicheck tool, on any inputs and playback (!) sources. I love it! Just a pity that one stops at 192 kHz. Mitch, that Lynx Hilo looks fantastic. Hmmm, interesting, will have to check out the possibilities regarding multiclient ASIO! Looks like will have to compile Audacity with ASIO myself to get the feature. Once more OT, but please .. I have recently did a try to HQPlayer 3.20.4. My "poor" opinion was that I could not hear any difference among HQPlayer and JRiver Media Center 24. I said that, and now the author (Miska) of HQPlayer is contrasting that. The thread is on https://www.computeraudiophile.com/forums/topic/25228-j-river-to-hqplayer/?page=10&tab=comments#comment-866800. Since I'm not an expert and I cannot do any measurement I'm overwhelmed by the Miska reaction. Can you please clarify to me (and the rest of humanity) that topic? Now, as for whether you were able to hear a difference, that of course is up to you to decide and report :-). I don't hear things many people report either. While I can appreciate technical perfection and strive to achieve it in whatever way I practically can, I do appreciate that there is a threshold to what I am able to experience. I see HQPlayer and what it can do as an example of that striving for qualitative and quantitative perfection utilizing the massive computational resources of what is within access these days. From my perspective, what's needed is a good ol' controlled blind listening test. No question that objectively the upsampling algorithm is superior to typical DAC filters. The question is how many people can hear it? With what equipment (especially what speakers and which headphones)? And of course with what music? but, let us forget the listening tests for a moment. 1. If in the service manual of a DAC I read "x1920 times Oversampled with CD/USB 44.1KHz Source", is it a marketing hipe (that is the signal is oversampled only 8 times)? Difficult to believe since the target frequency (84.672MHz) is a multiple of both 44.1KHz (x1920) and 48KHz (x1764) (and so on). Let me assume that John Westlakes knows the Mathematics too. 2. AFAIK in whatever way you upsample you don't add information to the signal. The choice of the method is strictly related to the filtration strategy, that in turns gives different "sonic" result. This is what I know (even if Miska suggested to me to review my knowledge about "reconstruction filtering"). So my final question is: it's worthwhile to upsample by software (e.g. with HQPlayer, JPlay, or even Sox in JRiver Media Center) knowing that the DAC does its own upsampling (x1920, I guess)? I assume the reference to 84.672MHz, 1920x oversampling, and John Westlake is referring to the ad material for the Audiolab 8200CDQ. From what I see, the device is based on the ES9018 DAC. I presume the 84.7MHz spec is just a reflection of what the sigma-delta modulator internally is running at. The DAC obviously cannot accept PCM data anywhere near that. 1. Correct, there is no new information added when upsampling. 2. The upsampling digital interpolator's job is to act as a high quality reconstruction bandlimited filter that prevents imaging. Algorithms simply vary in how accurate they perform on point 2. How much ripple is present in the audio band? 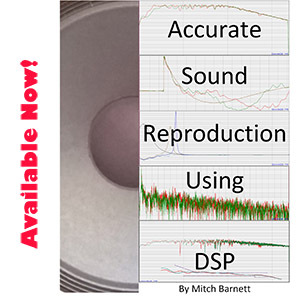 How much suppression of ultrasonic imaging? Does it add phase anomalies? How flat of a frequency response below Nyquist? Hard to imagine I'd need anything better. Not being a specialist on ES chips my take is that this number describes the internal upsampling needed for the ASRC mode that the ES offers (running on its own clock with USB or SPDIF input, working like a sample rate converter). Advertising that number seems a bit stupid as all the ES chips do it, so even the 100$ china converter from Ali Baba...unless I guessed wrong. Real graphs at the out put of the DAC would be greatly acknowledged. At some point for fun I might talk more about the digital filter stuff and play with more settings :-). As usual, no need to fret about audiophile claims! "MQA-CD x UHQCD" Listening Test by Agitater.